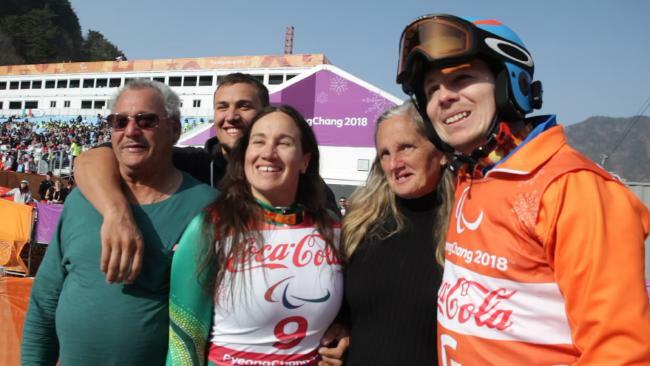 Australian Paralympian Melissa Perrine and her family after winning bronze. RONNIE Perrine does a bread delivery weekdays. And more, if that back wrecked by three major surgeries will let him. "But still," the tattooed Mittagong local smiles, "I never thought I'd be here." 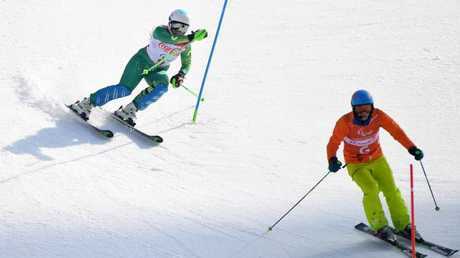 And by here, Ronnie means Jeongseon Alpine Centre. South Korea. A snowy, white cauldron where, right now, his daughter Melissa - blind since birth, a sufferer of epilepsy, and still bearing scars from where a jug of boiling water tipped on her, aged seven - has just won a giant slalom bronze, her second Paralympic medal in as many days having finished third in the super combined event the day previous. Christian Geiger guides Melissa Perrine down the hill. Until now, Ronnie has never seen his daughter ski live. Same deal, wife Denise. And landscaper son Nick, who up in the grandstand is unmistakeable in a black Everlast singlet. And you can imagine the chaos, right? None of which would be happening without Christian Geiger. Both coach and sight guide for Perrine, Geiger is also the man who, a few weeks back, quietly dipped into his pocket and paid those three airfares required to gift this family an opportunity they thought impossible. "Did I think I'd ever see Mel ski? No,'' says Denise, who until this trip had never even been on an aeroplane. "I dreamt about it obviously. A lot. "But I just didn't think it was possible." Nor did Ron, who hasn't been out of Australia since attending his mum's funeral in Mauritius over 20 years ago. "Couldn't afford to go home and bury my dad a few years later," he shrugs. "Or my brother. "So we cannot thank Christian enough for what he's given us." Melissa Perrine with guide Christian Gieger. 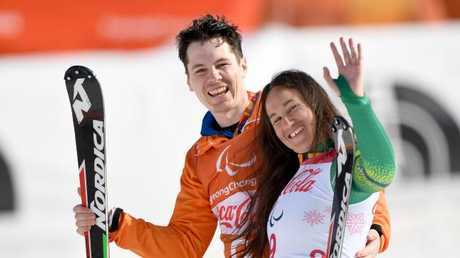 Who after competing in both the Vancouver and Sochi Games without success, has now bagged two medals in what could be her last Paralympic Games. "And to have my family here, it means the world,'' she said. "They've never seen me ski before and to have them in the crowd is awesome. Really, really cool." And as for little brother, a Mittagong Lions prop, wearing that singlet to his first ever Winter Paralympics? "Well, one of his nicknames is Sasquatch," she said. "And if you've seen him, you'll know he is a very large human being. I guess it also now means he enjoys the snow." Better, little brother is also doing what Channel 7 won't. 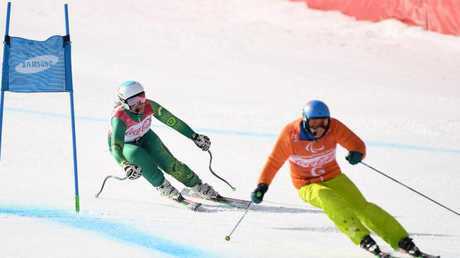 Perrine in action on the PyeongChang slopes. 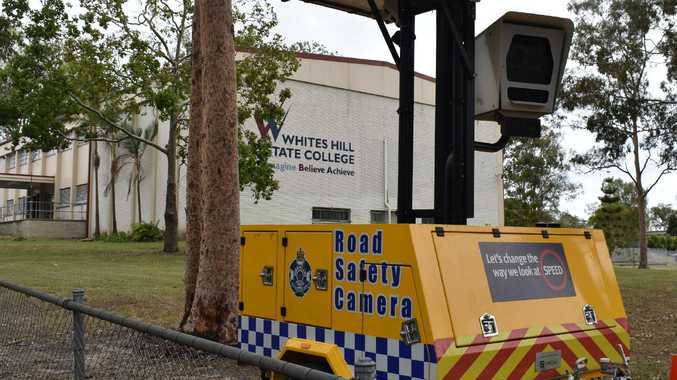 With the host broadcaster refusing to cover these Games live, and also barring the Australian Paralympic Committee from live streaming, this Southern Highlands landscaper has taken the gig upon himself. "I've had so many family and friends asking to see footage," the 22-year-old said. "So I'm using my phone to grab as much video as I can for Facebook. "You can't believe it really. But if we were back home, we wouldn't have even seen Mel's races. "So to be here, yeah, awesome." And with that, Sasquatch disappears for a beer.